Clara mourns the loss of her career. 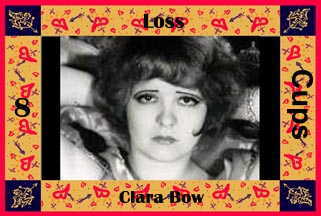 Hugely popular during the jazz age, Clara Bow made 56 movies before her career dove in 1933. Only 28 years old, she was a victim of '30s puritanism and her own Bronx accent, which wasn't melodious enough for Talkies. She lived another 32 years, never making another film. The Eight of Cups represents loss-- unexpected, out of our control, impossible to prepare for.